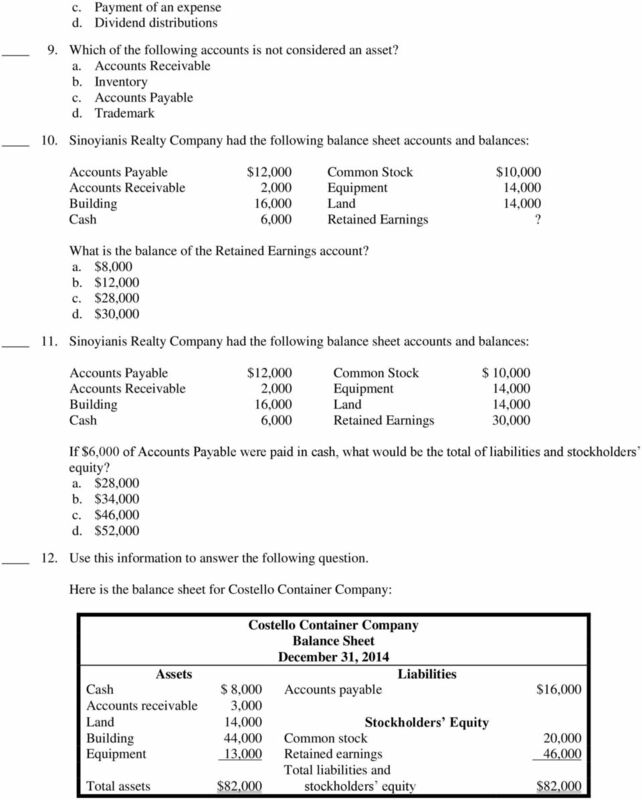 Download "Exam 1 chapters 1-4 Needles 10ed"
3 If the balance in the Cash account were used to buy more equipment, then the total assets would a. remain unchanged. b. increase by $8,000. c. decrease by $8,000. d. increase by $21, The Public Company Accounting Oversight Board was created by the a. Sarbanes-Oxley Act. b. GASB. c. IRS. d. IASB. 14. The purpose of an audit is to a. determine whether or not a company is a good investment. b. comply with income tax regulations. c. determine whether or not a company is a good credit risk. 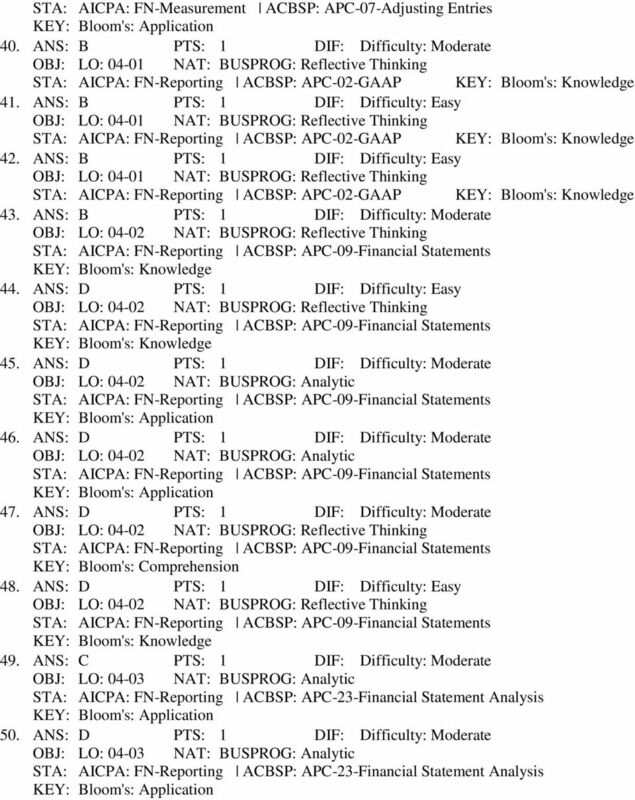 d. ascertain that the financial statements follow GAAP. 15. The issue of deciding when to record a transaction is solved by a. properly classifying the transaction. b. deciding on a point of recognition. c. assigning historical cost to the transaction. d. analyzing the intent of management. 16. Which of the following accounts is increased with a credit? a. Office Supplies b. Unearned Revenue c. Land d. Prepaid Insurance 17. The double-entry system a. requires that each transaction be recorded with at least one debit and one credit. b. requires that the total amount of the debits must always equal the total amount of the credits. c. is based on the principle of duality. d. All of these choices. 18. 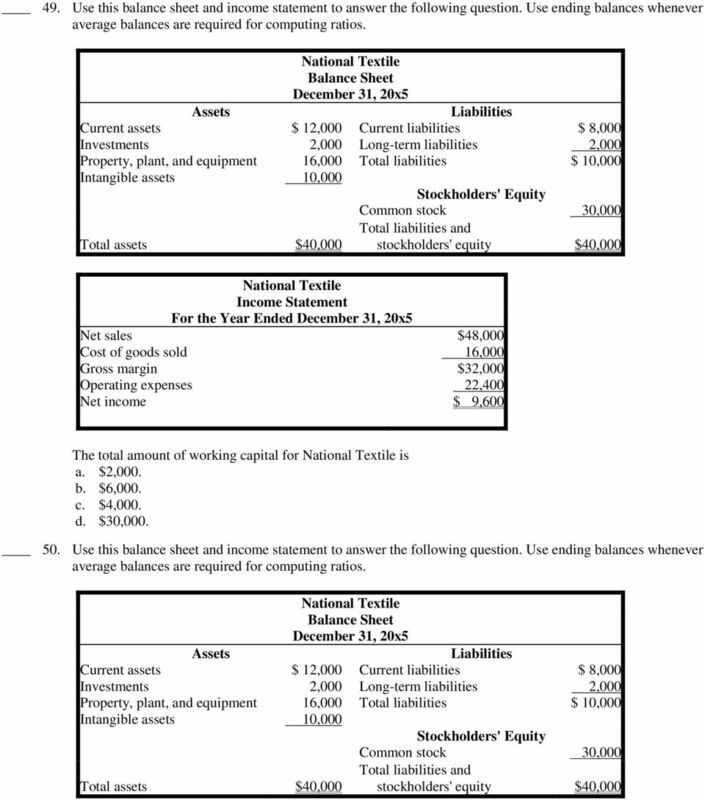 Which of the following does not impact the Statement of Retained Earnings? a. Common Stock b. 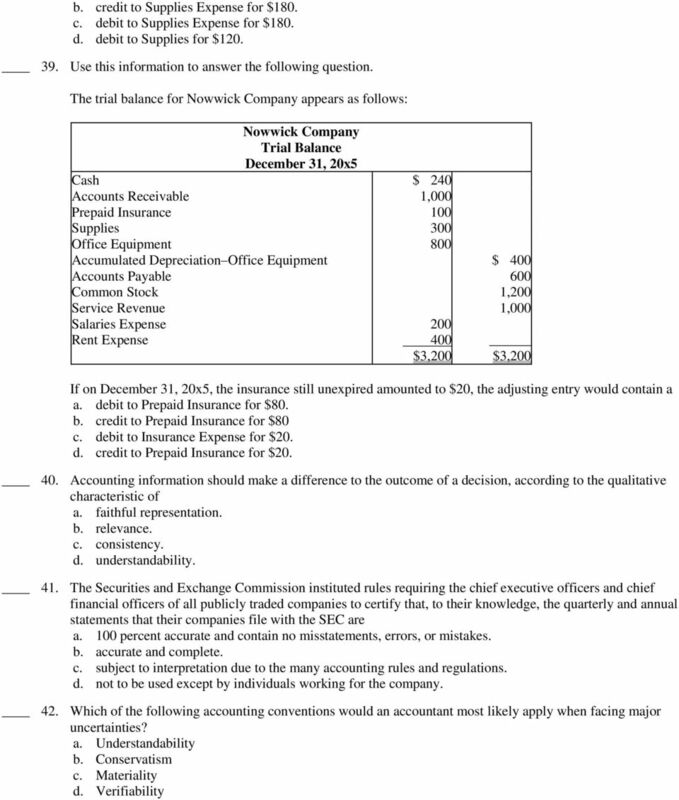 Revenues c. Expenses d. Dividends 19. The declaration of dividends will a. decrease net income. b. increase liabilities. c. not affect total assets. d. increase stockholders equity. 20. Receiving cash from a customer for settlement of an Accounts Receivable will a. decrease Stockholders Equity. b. increase net income. 4 c. increase total assets. 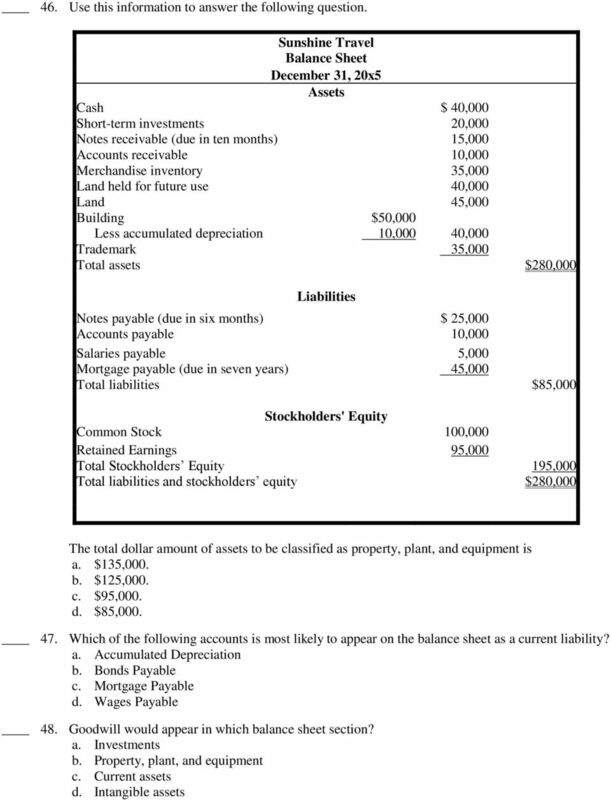 d. not affect total assets. 21. When a service has been performed, but no cash has been received, which of the following statements is true? a. The entry would include a debit to Accounts Receivable. b. The entry would include a debit to Accounts Payable. c. The entry would include a credit to Unearned Revenue. d. No entry is required until the cash is received. 22. The controller for Tires and More, Inc. has recorded the following transactions during the month: the purchase of equipment for $8,500 cash; payment of $6,300 for 3 months of rent; and, collection of $2,400 from a customer for services performed. At the beginning of the month the company was established by selling 10,000 shares of stock to the public for $15,000 cash. What is the balance in the Cash account at the end of the month, and is the balance a debit or a credit? a. $2,600 debit. b. $2,600 credit. c. $6,800 debit. d. $15,200 debit. 23. The trial balance for Parker Company is as follows: Parker Company Trial Balance January 31, 20x5 Cash $ 6,000 Accounts Receivable 4,000 Art Supplies 6,000 Office Supplies 10,000 Prepaid Rent 14,000 Prepaid Insurance 10,000 Art Equipment 10,000 Office Equipment 6,000 Accounts Payable $ 10,000 Common Stock 30,000 Dividends? Advertising Fees Earned? Wages Expense? Utilities Expense 10,000 Telephone Expense 6,000 $ A $ B If the balance of the Dividends account were $100,000 and the balance of the Wages Expense account were $10,000, what would be the amount of B? a. $124,000 b. 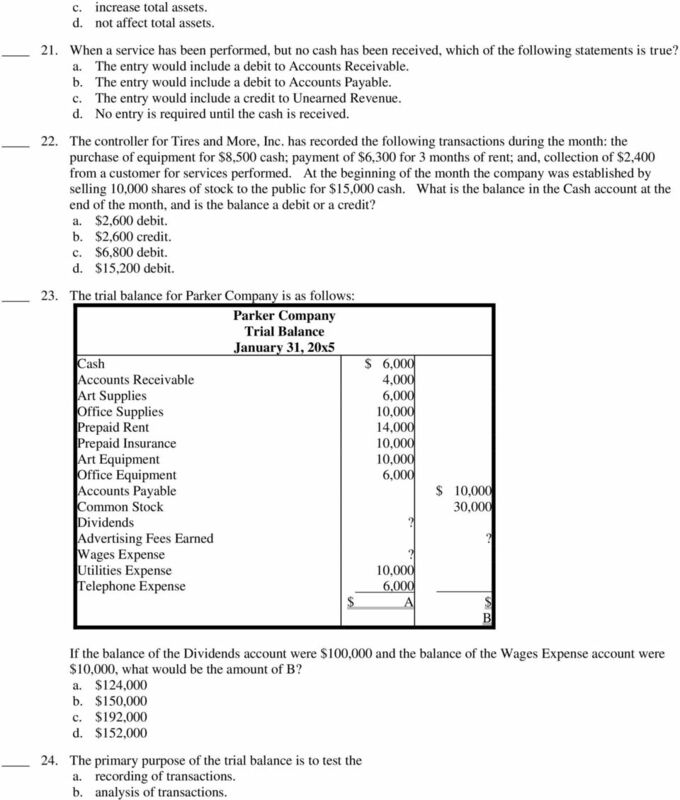 $150,000 c. $192,000 d. $152, The primary purpose of the trial balance is to test the a. recording of transactions. 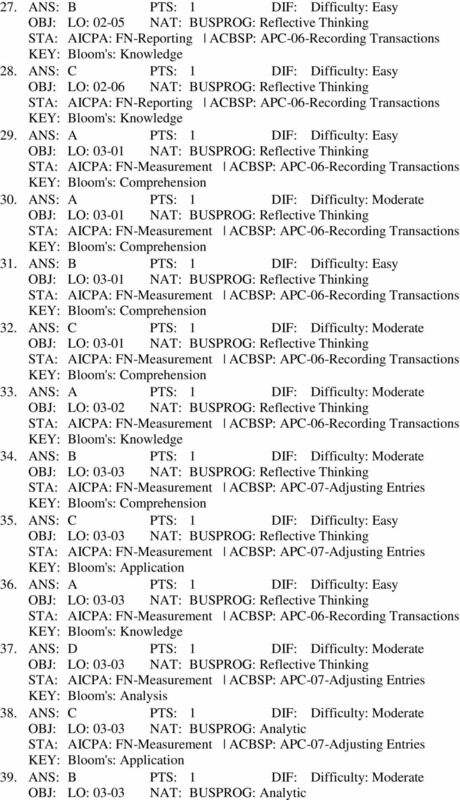 b. analysis of transactions. 5 c. equality of debit and credit balances in the ledger. d. equality of debit and credit balances in the journal. 25. 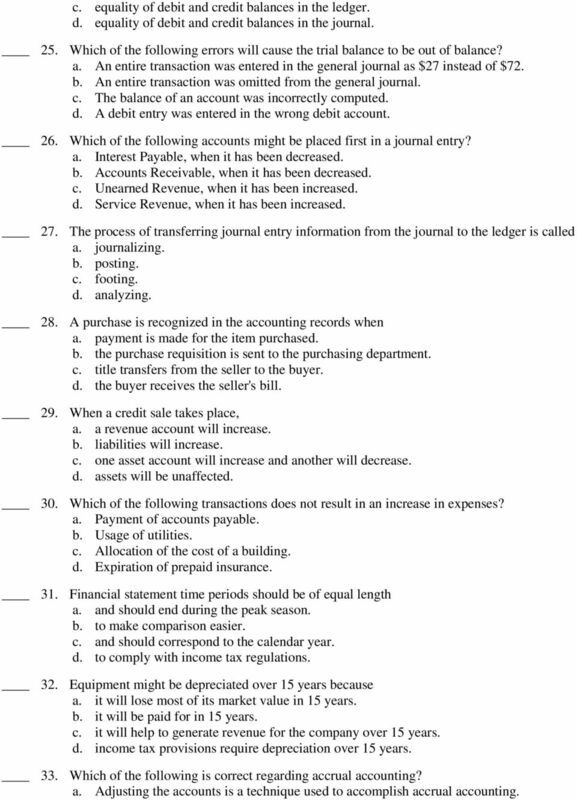 Which of the following errors will cause the trial balance to be out of balance? a. An entire transaction was entered in the general journal as $27 instead of $72. b. An entire transaction was omitted from the general journal. c. The balance of an account was incorrectly computed. d. A debit entry was entered in the wrong debit account. 26. Which of the following accounts might be placed first in a journal entry? a. Interest Payable, when it has been decreased. b. Accounts Receivable, when it has been decreased. c. Unearned Revenue, when it has been increased. d. Service Revenue, when it has been increased. 27. 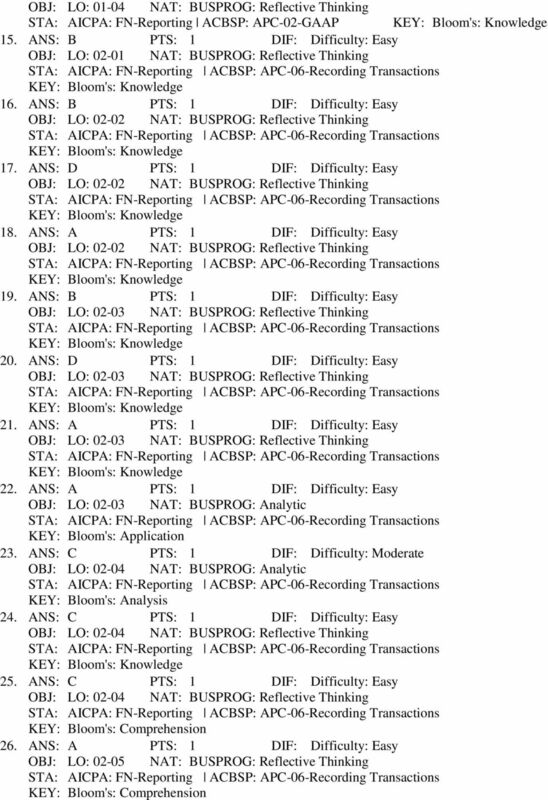 The process of transferring journal entry information from the journal to the ledger is called a. journalizing. b. posting. c. footing. d. analyzing. 28. A purchase is recognized in the accounting records when a. payment is made for the item purchased. b. the purchase requisition is sent to the purchasing department. c. title transfers from the seller to the buyer. d. the buyer receives the seller's bill. 29. When a credit sale takes place, a. a revenue account will increase. b. liabilities will increase. c. one asset account will increase and another will decrease. d. assets will be unaffected. 30. Which of the following transactions does not result in an increase in expenses? a. Payment of accounts payable. b. Usage of utilities. c. Allocation of the cost of a building. d. Expiration of prepaid insurance. 31. Financial statement time periods should be of equal length a. and should end during the peak season. b. to make comparison easier. c. and should correspond to the calendar year. d. to comply with income tax regulations. 32. Equipment might be depreciated over 15 years because a. it will lose most of its market value in 15 years. b. it will be paid for in 15 years. c. it will help to generate revenue for the company over 15 years. d. income tax provisions require depreciation over 15 years. 33. Which of the following is correct regarding accrual accounting? a. Adjusting the accounts is a technique used to accomplish accrual accounting. 6 b. Revenues are recorded when received. c. Expenses are recorded when earned. d. Net income is the difference between cash receipts from customers and cash payments for expenses. 34. Which of the following accounts would not need to be adjusted at year end? a. Prepaid Rent. b. Common Stock. c. Equipment. d. Unearned Rent Revenue. 35. An adjusting entry made to record salaries earned but not yet paid or recorded is made with which of the following entries? a. Salaries Expense Debit; Cash Credit b. Salaries Payable Debit; Salaries Expense Credit c. Salaries Expense Debit; Salaries Payable Credit d. Cash Debit; Salaries Expense Credit 36. Which of the following accounts is a contra account? a. Accumulated Depreciation Office Furniture b. Interest Payable c. Depreciation Expense Office Furniture d. Unearned Revenue 37. Failure to adjust for expired prepaid insurance at year end will result in an a. overstatement of liabilities. b. understatement of assets. c. understatement of stockholders' equity. 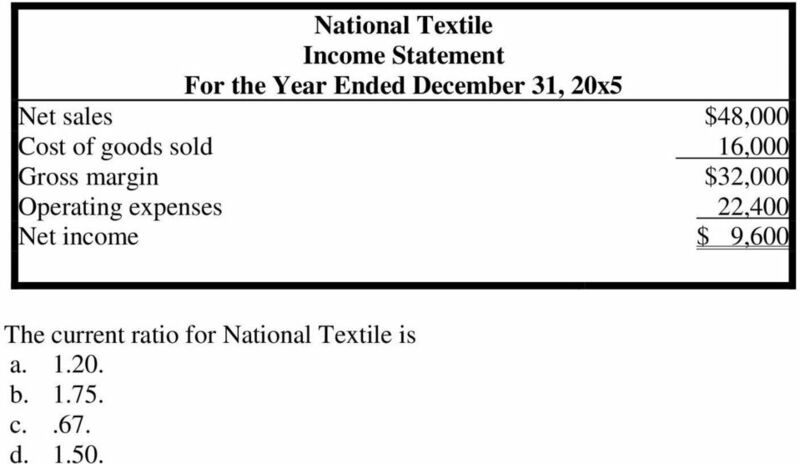 d. overstatement of net income. 38. Use this information to answer the following question. 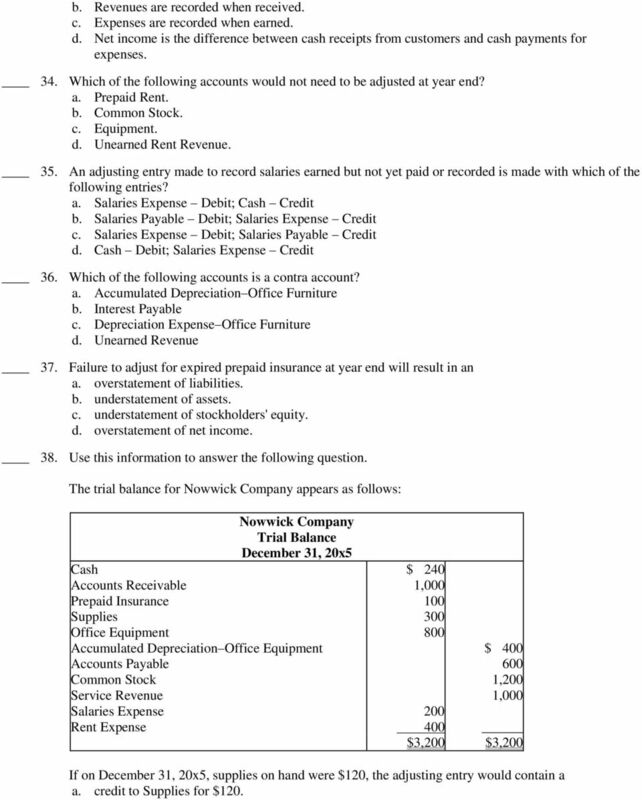 The trial balance for Nowwick Company appears as follows: Nowwick Company Trial Balance December 31, 20x5 Cash $ 240 Accounts Receivable 1,000 Prepaid Insurance 100 Supplies 300 Office Equipment 800 Accumulated Depreciation Office Equipment $ 400 Accounts Payable 600 Common Stock 1,200 Service Revenue 1,000 Salaries Expense 200 Rent Expense 400 $3,200 $3,200 If on December 31, 20x5, supplies on hand were $120, the adjusting entry would contain a a. credit to Supplies for $120. 8 43. A company should classify land held for a planned manufacturing facility as a. an intangible asset. b. an investment. c. a current asset. d. property, plant, and equipment. 44. Which of the following should be classified as an intangible asset? a. Land held for future use b. Long-term notes receivable c. Special funds established to pay off a debt d. Copyright 45. Use this information to answer the following question. 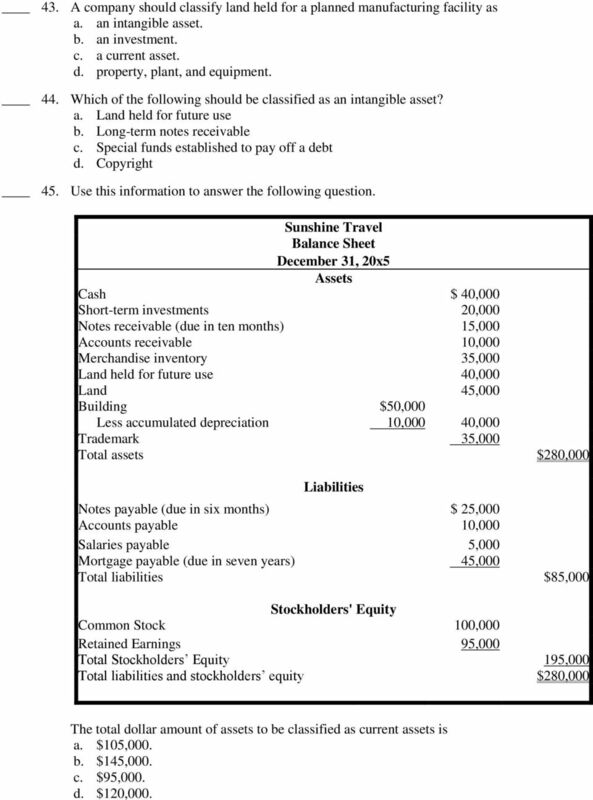 Sunshine Travel Balance Sheet December 31, 20x5 Assets Cash $ 40,000 Short-term investments 20,000 Notes receivable (due in ten months) 15,000 Accounts receivable 10,000 Merchandise inventory 35,000 Land held for future use 40,000 Land 45,000 Building $50,000 Less accumulated depreciation 10,000 40,000 Trademark 35,000 Total assets $280,000 Liabilities Notes payable (due in six months) $ 25,000 Accounts payable 10,000 Salaries payable 5,000 Mortgage payable (due in seven years) 45,000 Total liabilities $85,000 Stockholders' Equity Common Stock 100,000 Retained Earnings 95,000 Total Stockholders Equity 195,000 Total liabilities and stockholders equity $280,000 The total dollar amount of assets to be classified as current assets is a. $105,000. b. $145,000. c. $95,000. d. $120,000. 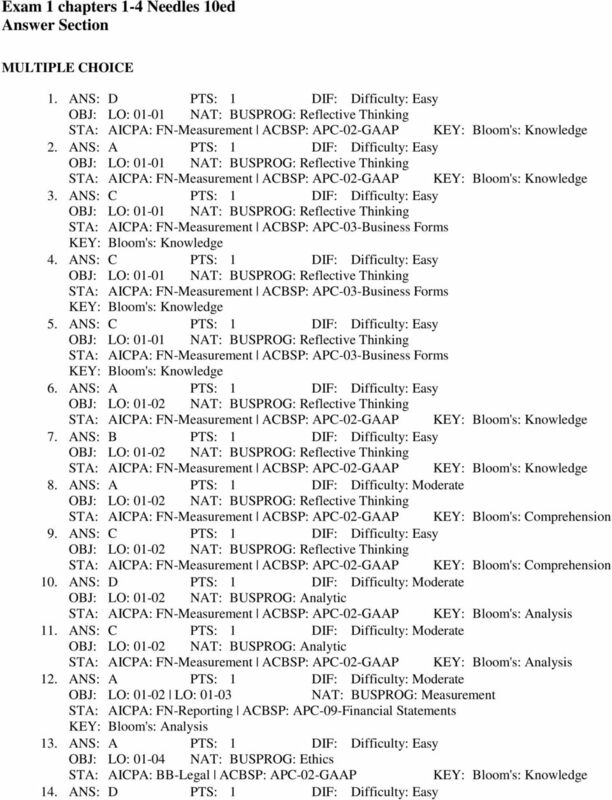 Exercises: Set B 9 Exercises: Set B E3-1B Selected transactions for Ample Advertising Company, Inc., are listed here. 1. Issued common stock to investors in exchange for cash received from investors. 2.